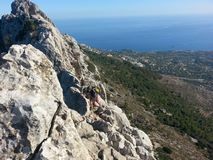 The Alicante region boasts some the best bolted rock climbing in Europe offering a huge variety of single and multi- pitch rock climbs to suit all levels of climber. The CADETROCK expedition is an 8-day course in a multi-pitch environment predominantly on bolted routes. The content includes clothing and equipment, access and conservation, mountain hazards, weather, care and use of equipment, rope management and knot tying, belaying techniques, climbing techniques, multi pitch climbing, abseiling, setting up anchors, gear placement/protection and, subject to skill level, an introduction to leading in the outdoor and indoor environment. The outcome is for the candidate to be a competent second on a multi pitch rock climb.